How perfectly queer and AMAZING. 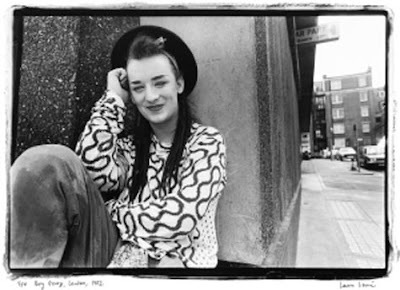 The TV production company behind the seminal Queer As Folk, Red, are to begin shooting a 90 minute drama about Boy George! Called Worried About the Boy, it will begin with his leaving suburbia through to global pop stardom. And what's in between will be Malcom McLaren, Marilyn, Steve Strange, Philip Sallon, The Blitz and of course Culture Club. I think I've just fainted. What's even more interesting is the casting. Burberry's poster boy, newcomer Douglas Booth, will portray George (which will please the Boy himself, no end), Gavin & Stacey's Mathew Horne will play drummer Jon Moss, Hustle's Marc Warren will play Steve Strange and - this is VARE interesting casting - League of Gentlemen's Mark Gatiss will be Malcolm McLaren. Like I said. Can't wait! Read here at the Guardian for the full lowdown. The BBC press release can be found here. Oh I've been waiting for something like this. I can't wait! That was a very interesting time in Englad full of the most interesting people in music (most of them gender-benders! ).